Name and Status. 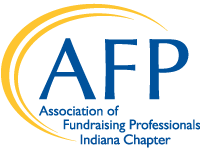 The name of this corporation is the AFP Indiana Chapter (“Chapter”), which is incorporated as a nonprofit corporation under the laws of the State of Indiana and which is a chapter and affiliate of the Association of Fundraising Professionals (“AFP” or the “Association”). The Board of Directors of AFP has granted a charter to the Chapter, which agrees to conduct its affairs and programs in compliance with the strategic plans, policies, procedures, Articles of Incorporation and Bylaws of the Association and which has entered into a separate Chapter Affiliation Agreement with the Association to further set forth the terms of affiliation. Section 1. General Purposes. The Chapter is organized and shall be operated exclusively for one or more of the purposes as specified in section 501(c)(3) of the Internal Revenue Code. Section 2. Specific Objectives and Purposes. The specific objectives and purposes of the Chapter shall be to promote the common professional interests of AFP members as stated in the Bylaws of the Association, and to further the purposes of the Chapter through nonprofit activities including, but not limited to, education, training, meetings, workshops, publications and other relevant activities. The Chapter shall be responsible for educating the membership and the public regarding the AFP Code of Ethical Principles and Standards (“Code”). The Chapter shall not conduct investigations or consider allegations of violations of the Code made against members, nor shall it suggest, issue, or render advisory opinions on matters related to the Code, but shall refer such matters to the AFP Ethics Committee. The Chapter shall function in accordance with the Association's statement of the "Role of Chapters in the AFP Ethics Process" and in accordance with the AFP statement of Procedures Relating to Enforcement of the Code. Section 1. Membership. All members of the Chapter must be members of the Association in compliance with the policies, procedures, and Bylaws of the Association. Section 2. Categories. Membership categories for the Chapter shall be consistent with the AFP categories of membership as determined by the Association Board of Directors, which shall adopt policies and procedures setting voting privileges; eligibility for membership in each category; application and acceptance procedures; payment schedules; procedures for notifying delinquent members; establishing the date after which members will be dropped from membership for nonpayment; policies regarding transferability and reinstatement of membership; and, required national dues and fees for each membership category. Section 3. Voting. A member is eligible to vote if (s)he meets the criteria for voting membership in the Association and the Chapter. Each such member present at a membership meeting of the Chapter shall be entitled to one vote. If applicable state law permits, members may also vote electronically in accordance with such law. Section 4. Dues. Members shall pay annual dues to the Association as determined from time to time by the Association Board of Directors and annual dues to the Chapter as determined from time to time by the Chapter Board of Directors. Section 1. Regular Meetings. Regular meetings of the Chapter members shall be held at least quarterly on such dates and at such times and places as the Chapter Board of Directors shall determine. The Chapter shall hold an annual meeting, which may be one of the regular meetings, for the purposes of electing directors and officers, receiving financial statements, receiving reports of officers and committees, and such other business as shall be determined by the Chapter Board of Directors. Written notice of regular and annual meetings shall be given to the members at least fifteen (15) days prior to the meeting. Section 2. Special Meetings. Special meetings of members may be called by the Chapter Board of Directors, or by petition delivered to the Secretary of 25% of the Chapter membership eligible to vote. Written notice of special meetings shall be given to members at least thirty (30) days prior to the meeting and shall state the purpose(s) of the meeting; no business other than that stated in the notice shall be considered at the meeting. Section 3. Quorum. At least ten (10) percent OR at least fifty (50) of the members of the Chapter who are eligible to vote shall constitute a quorum, unless a higher number is required by applicable law. Section 2. General Authority. The Board of Directors of the Chapter shall govern, manage, supervise, and control the business, property and affairs of the Chapter consistent with the strategic plan, policies and procedures, Articles of Incorporation and Bylaws of the chapter and the Association. No action taken by the Chapter Board of Directors shall conflict with action taken by the Association's Board of Directors. Section 3. Chapter Board of Director Meetings. The Chapter Board of Directors shall meet at least once a year in person on such dates and at such times and places as the Chapter Board of Directors shall determine. Additional meetings of the Board may be held as determined and scheduled by the Chapter Board of Directors. Written notice of meetings of the Board shall be given to Directors at least ten (10) days prior to the meeting. Directors may participate and vote in Board meetings held by telephone conference call, unless otherwise provided by applicable law. Section 4. Quorum. A majority of the Board of Directors shall constitute a quorum for the transaction of business at any meeting of the Chapter Board. Section 5. Term of Office. Directors shall serve one year terms. No director may serve more than eight years consecutively on the chapter board unless also serving as president, president-elect or immediate past president. A one-year break in service is required otherwise. Section 6. Manner of Election of Directors. The Committee on Directorship shall present a slate of director nominees to all Chapter members at least fifteen (15) days prior to the annual meeting. Voting shall be conducted pursuant to policies, procedures and criteria adopted by the Chapter Board of Directors. Section 7. Resignation and Removal. A director may resign at any time by giving written, including electronic mail, notice to the president or secretary. Such resignation shall take effect at the time specified therein and, unless otherwise specified therein, the acceptance of such resignation shall not be necessary to make it effective. Any director may be removed by a majority vote at any regular or special meeting of the board, at which a quorum is present, for any reason. Section 8. Vacancies. In case of resignation of a director or vacancy in a director position, the Board of Directors shall fill such vacancy for the unexpired term of such director. Any director filling an unexpired term will be eligible to serve one additional one year term, except as otherwise provided in Article VI, Section 5. Section 1. Officers. The officers of the Chapter shall be a President, President-elect, Immediate Past President, Vice Presidents (as determined by the chapter board as necessary or advisable), a Secretary, and a Treasurer. All officers must be members of the Chapter Board of Directors and shall serve without compensation. The officers shall perform the duties prescribed by these Bylaws. The offices of Secretary and Treasurer may be held by the same individual. Section 2. Manner of Election of Officers. The Committee on Directorship shall present a slate of officer nominees to all Chapter members at least fifteen (15) days prior to the annual meeting in accordance with policies and procedures adopted by the Chapter Board of Directors. The officers shall be elected at an annual meeting of the membership, and shall serve one year terms, with a maximum of two terms in each office, but may qualify for two additional one year terms after a minimum one year break in service, for a total lifetime service of four years in each office. Section 3. Resignations and Removal. An officer may resign at any time by serving written notice to the President or Chapter Board of Directors. Such resignation shall take effect at the time specified therein or, if no time is specified, upon receipt by the President or the Chapter Board of Directors. Any elected officer may be removed, for any reason, at any time by a majority vote of the members of the board then in office. Removal may occur at any regular or special meeting of the board. Section 4. Vacancies. In case of resignation of an officer or vacancy in an officer position, the Board of Directors shall fill such vacancy for the unexpired term of such officer in accordance with policies and procedures adopted by the Chapter Board. If the office of President becomes vacant, the President-elect shall become President for the unexpired term and shall, if acceptable to the individual, continue to serve as President for a full term beginning at the end of the unexpired term. Section 5. President . The President of the Chapter shall perform the duties commonly incident to the office of the president including, but not limited to, chairing meetings of the Board and membership of the Chapter. Section 6. President-elect. The President-elect shall perform the duties of the President during the absence or disability of the President and such other duties as the President and the Chapter Board of Directors may designate. Section 7. Vice President(s). A Vice President shall perform such duties as the President and the Chapter Board of Directors may designate. Section 8. Treasurer. The Treasurer of the Chapter shall perform the duties commonly incident to the office of the treasurer and such other duties as the President or Chapter Board of Directors may designate. The Treasurer shall be responsible for all records and filings related to the finances of the Chapter. Section 9. Secretary. The Secretary of the Chapter shall perform the duties commonly incident to the office of secretary and such other duties as the President and Chapter Board of Directors may designate The Secretary shall keep a book of minutes of all regular meetings of the Board and, if directed by the Board, meetings of committees and of members and shall assure that all notices are duly given in accordance with the provisions of these Bylaws or as required by law. Section 1. Standing Committees. The Chapter shall have the following Standing Committees and the Chapter Board of Directors may establish and appoint other committees in accordance with policies and procedures adopted by the Board. Executive Committee. The Chapter Executive Committee shall be composed of the officers. The Chapter Executive Committee shall have the powers of the Board necessary to conduct the business of the Chapter between meetings of the Chapter Board of Directors, but may not fill vacancies in Directors, adopt, amend or repeal bylaws, or set membership fees. The Chapter Executive Committee shall convene upon the call of the President. A majority of the Executive Committee shall constitute a quorum. Committee on Directorship. The Committee on Directorship shall consist of at least three members, including the Immediate Past President, who shall serve as Chair of the Committee. The rules contained in the current edition of Robert's Rules of Order shall govern the Chap­ter in all cases to which they are applicable and in which they are not inconsistent with the law, these Bylaws, or the policies, procedures, or Bylaws of the Association. Section 1. Limitations. The Chapter shall use its funds only to accomplish the objectives and purposes specified in these Bylaws, and no part of the net earnings, gains or assets of the Chapter shall inure to the benefit of, or be distributable to, its directors, officers, other private individuals, or organizations organized and operating for profit, except that the Chapter is authorized and empowered to pay reasonable fees for products and services consistent with the limitations set forth in policies, procedures, or the Bylaws of the Chapter. Section 2. Dissolution. Upon dissolution or final liquidation of the Chapter, any remaining assets of the Chapter shall, after payment or the making of provision for payment of all the lawful debts and liabilities of the Chapter, be distributed to the AFP Foundation for Philanthropy. These Bylaws may be amended at any membership meeting of the Chapter by a two-thirds vote of the eligible members casting votes provided a quorum exists and, provided that the amendment has been submitted in writing to the Association not less than sixty (60) days and to the membership not less than thirty (30) days prior to the meeting at which the amendments will be considered by the membership. The fiscal year of the Chapter shall be the calendar year, or as otherwise determined by the Association Board of Directors. Section 1. Indemnification by Corporation of Directors and Officers. The directors, officers, committee members, employees, and other volunteers of the Chapter shall be indemnified by the Chapter to the fullest extent permissible under the laws of this state. Section 2. Insurance for Corporate Agents. The Chapter Board of Directors shall, in a current and timely manner, fulfill the requirements set forth by the Association’s Directors and Officers Liability Insurance program.